Written by Mark Umbreit, internationally known for his work in restorative justice, this indispensable resource offers an empirically grounded, state-of-the-art analysis of the application and impact of victim offender mediation, a movement that has spread throughout North America and abroad. 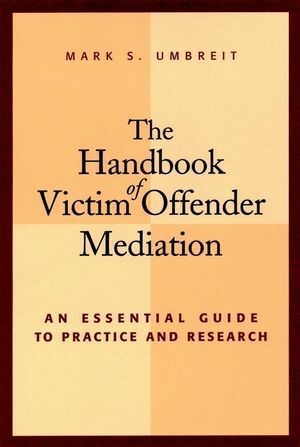 The Handbook of Victim Offender Mediation provides practical guidance and resources for offering victim meditation in property crimes, in minor assaults, and, more recently, with crimes of severe violence, including with family members of murder victims who request to meet the offender. MARK S. UMBREIT is the founding director of the University ofMinnesota's Center for Restorative Justice & Peacemaking andthe National Restorative Justice Training Institute. He is aprofessor in the School of Social Work at the University ofMinnesota. Introduction: Restorative Justice Through Victim OffenderMediation. Humanistic Mediation: A Transformative Journey ofPeacemaking. Guidelines for Victim-Sensitive Mediation and Dialogue withOffenders. The Mediation Process: Phases and Tasks. Multicultural Implications of Victim Offender Mediation. National Survey of Victim Offender Mediation Programs. WHAT WE ARE LEARNING FROM RESEARCH. The Impact of Victim Offender Mediation: Two Decades ofResearch. Cross-National Assessment of Victim Offender Mediation. Victim Offender Mediation in the United States: A MultisiteAssessment. Victim Offender Mediation in Canada: A Multisite Assessment. Victim Offender Mediation in England: A Multisite Assessment. Advanced Mediation and Dialogue in Crimes of Severe Violence. Appendix A. Resources: Organizations, Publications,Videotapes. Appendix B. Directory of VOM Programs in the United States. Appendix D. Promising Practices and Innovations. Appendix E. Summary of Forty VOM Empirical Studies. Appendix F. Assessing Participant Satisfaction with VOM.